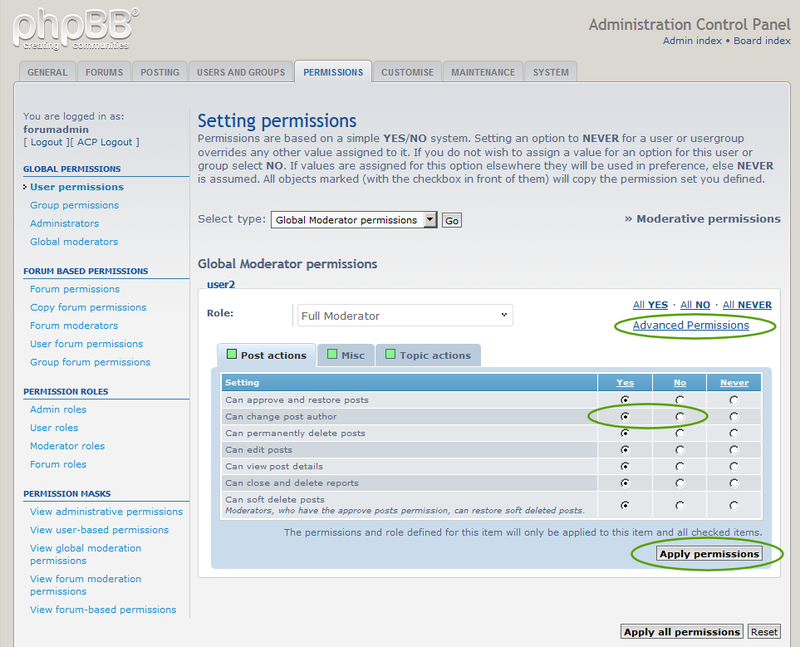 Forum Users Permissions on Main user may assign moderating and also administration rights to any other users. Let's see how it may be done in ACP console. Forum Users Permissions on phpBB forum. Front Page > Features > More detailed user guides > Forum Users Permissions on phpBB forum. At first, log is as main user to ACP console. Choose "Permissions" tab there. For next, on page "User permissions" type username to "Find a member" search box and click "Submit" button to find particular user. Select permissions type, you would like to work with. Then assign a role, choose from dropdown menu, for example "Full Moderator". Be sure, that you save your choice with clicking "Apply all permissions". There is also possible to assign permissions more specifically using "Advanced Permissions" dialog. Be sure to click buttons "Apply Permissions" after changes. For understanding differences of how moderator types are differing of each other and other specifics on permission settings, check out phpBB user guides site. At first, log is as main user to ACP console Choose "Permissions" tab there Main user may assign moderating and also administration rights to any other users. Let's see how it may be done in ACP console.